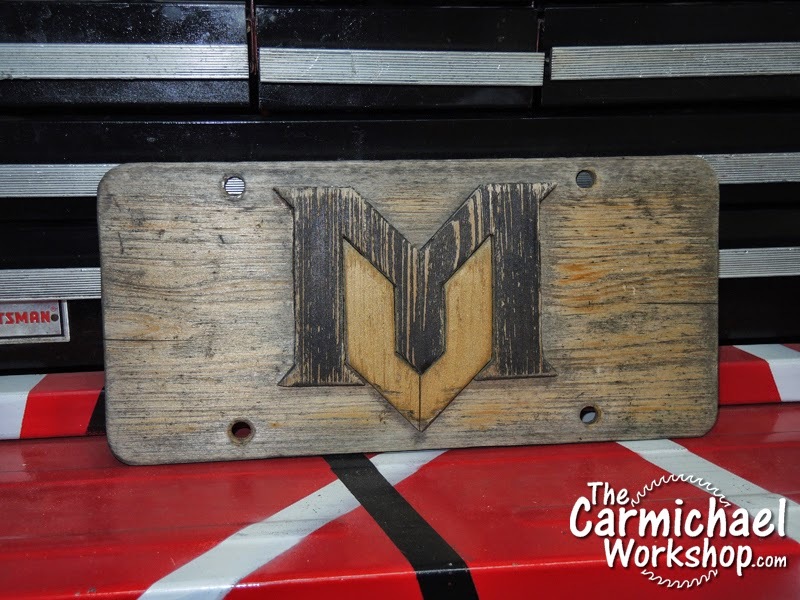 Win MicroJig Gear from The Carmichael Workshop! UPDATE 12-13-2014! The winners were selected at random via random.org and automatically displayed in the widget below! Congratulations to Russell R. for winning the GRR-Rippers and to John F. for winning the GRR-Rip Blocks! Both winners have been contacted and confirmed. Thanks to all who entered and to MicroJig for the awesome prizes! If you cannot see the giveaway widget, try clearing your cache, turning off pop-up blockers, turning off ad-blocking plugins, or try a different browser. If you are on a mobile device, try using a desktop computer. It's Thanksgiving here in the USA and I'm thankful that my beautiful wife parks her car outside on the driveway so I can do woodworking on her side of the garage! Watch the video below of the Coffee Mug Rack that I made for her to show my appreciation. Happy Thanksgiving! Click here to enter the MicroJig Giveaway! 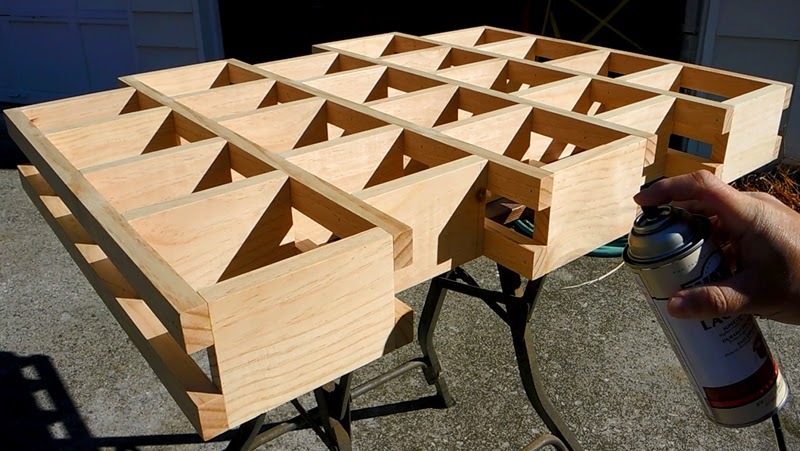 I purchased two 8-foot 1x12 pine boards from the home center for this project. After it was completed, I had about 4 feet of 1x12 left over. I assembled the Coffee Mug Rack using brad nails and wood glue. Below are the basic steps to build this project. Click here for a parts list and assembly diagram! Step 1: Cut two sections of 1x12 into smaller pieces so they are easier to work with. One piece should be 23.75" and the other 26.5". Step 2: Cut four 1.25" wide strips from the 23.75" board for the vertical end pieces. 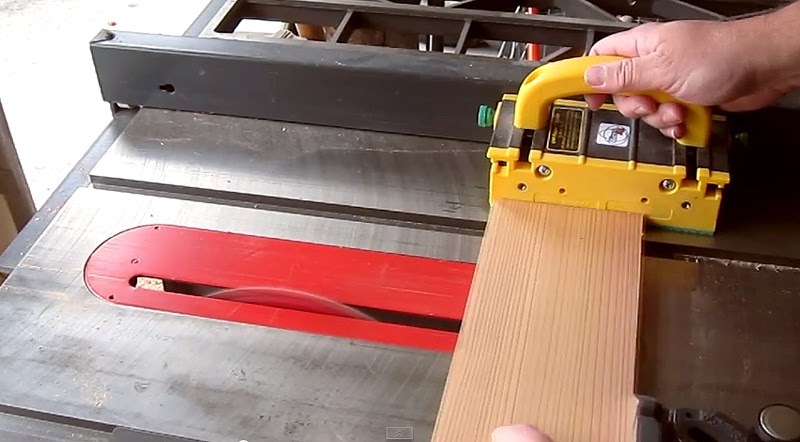 Cut eight 1.25" wide strips from the 26.5" board for the vertical middle pieces. 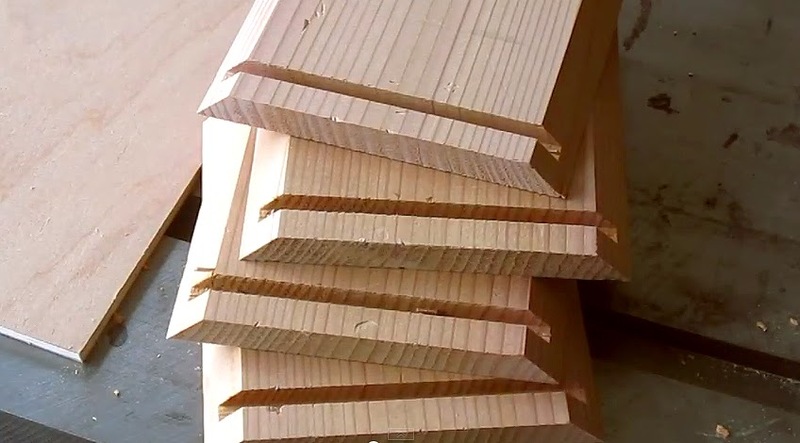 Step 3: Cut twenty-five pieces that are 4.25" wide and 6" long for the shelves. 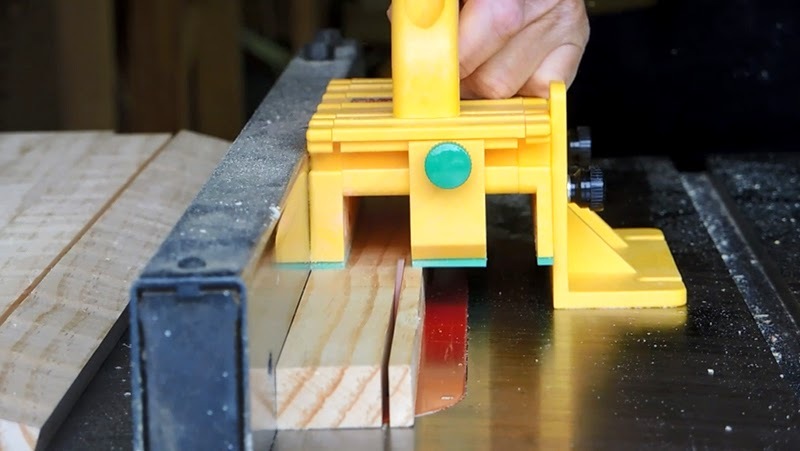 Cut two pieces that are 1" wide and 6" long for mounting cleats. Step 4: Sand all of the pieces prior to assembly. Use 4.5" and 5.5" long spacer blocks to assemble the Coffee Mug Rack according to the picture. Note that the height of the shelves alternates between these two sizes. 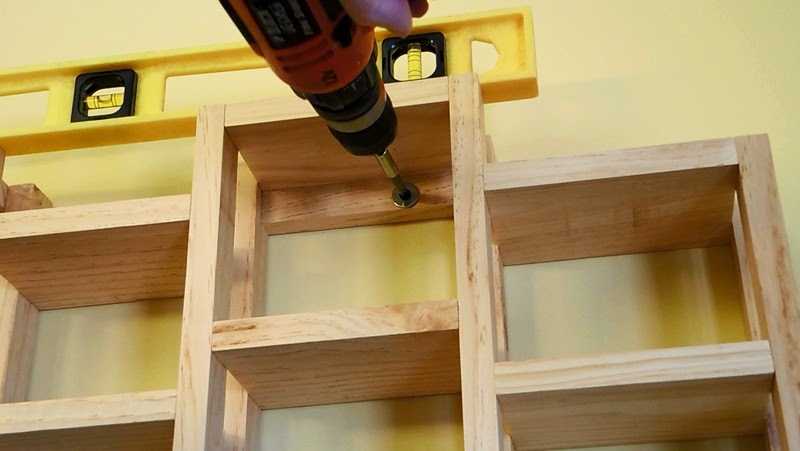 Attach mounting cleats underneath the top of the two tallest columns of shelves. 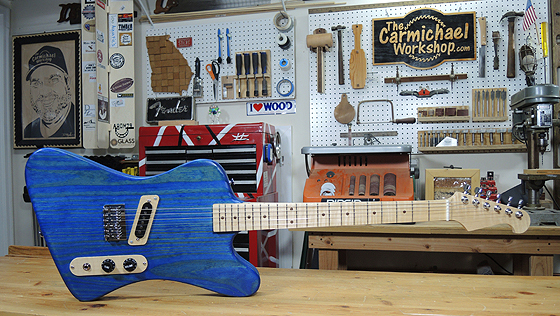 Step 5: After the glue has dried, apply your choice of finish. I used spray lacquer. A spray finish would be the easiest to apply. Step 6: Mount the Coffee Mug Rack to two wall studs with screws or bolts. The rack will be heavy when filled with mugs, so it is important that you mount it securely to wall studs. 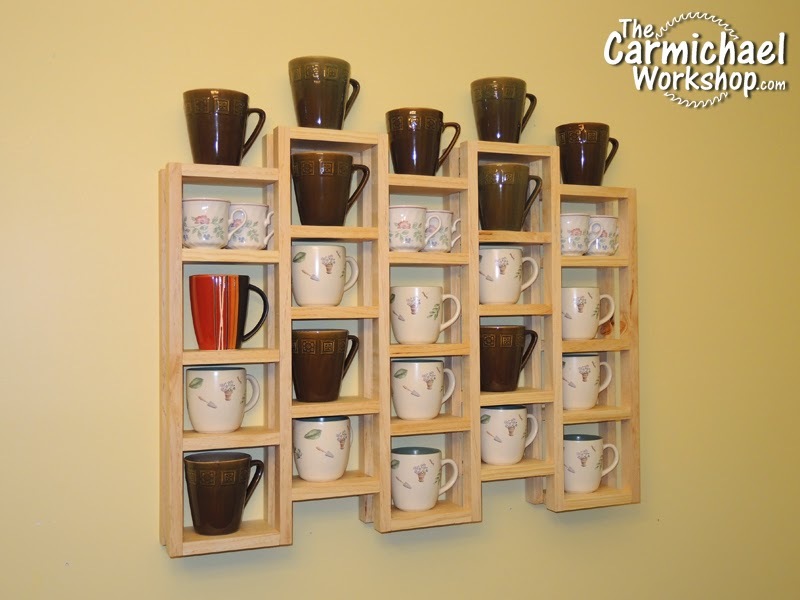 Fill the rack with your favorite coffee mugs and enjoy a cup while you admire your work! 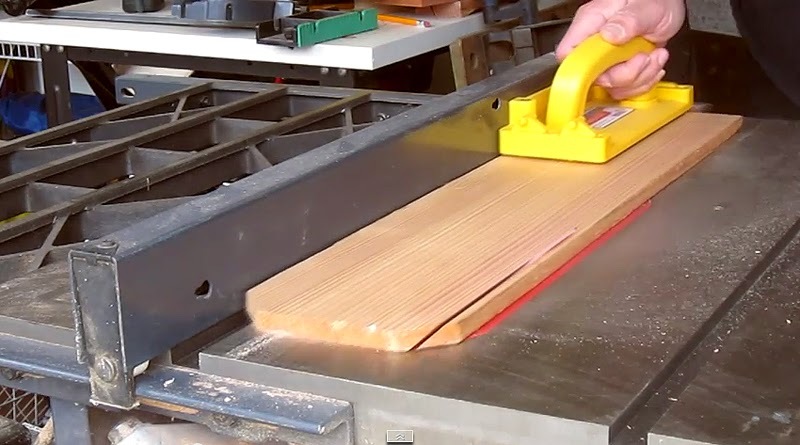 Welcome to a tour of my woodworking shop! My workshop is on my wife's side of our two-car garage. My side of the garage has our gardening equipment plus my drum practice room. When we bought our house, we could park both cars in the garage, but now they live outside on the driveway. Enjoy the tour! 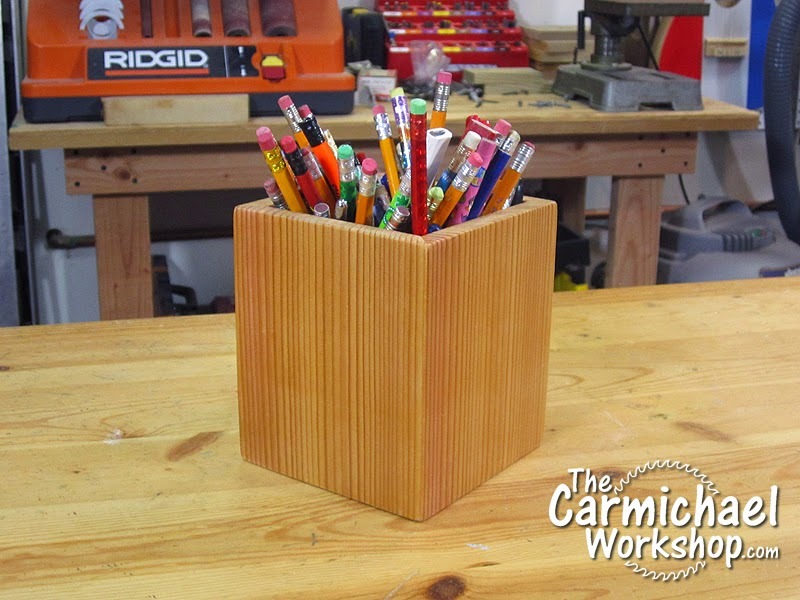 Make a Pencil Holder for Your Workbench! If you are like me, you are always losing your pencils. 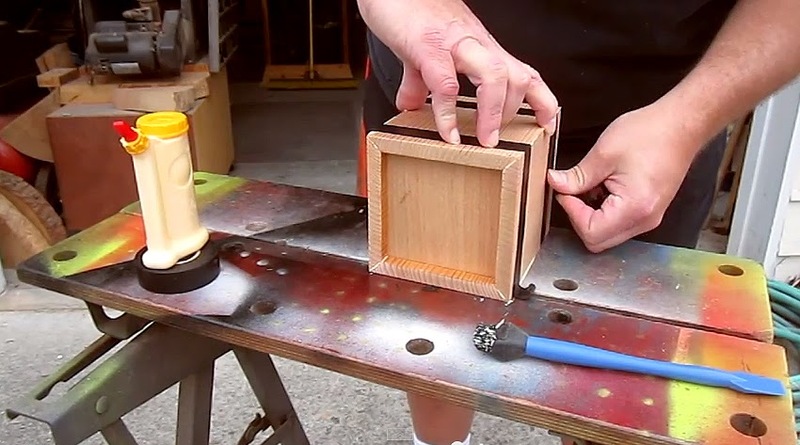 Here is a quick and easy Pencil Box that you can make for your workbench so that you can always find a pencil. My pencil box is about the size of a 5" cube and it's made from a cedar fence board. I started by cutting 45 degree bevels on both sides of the board. 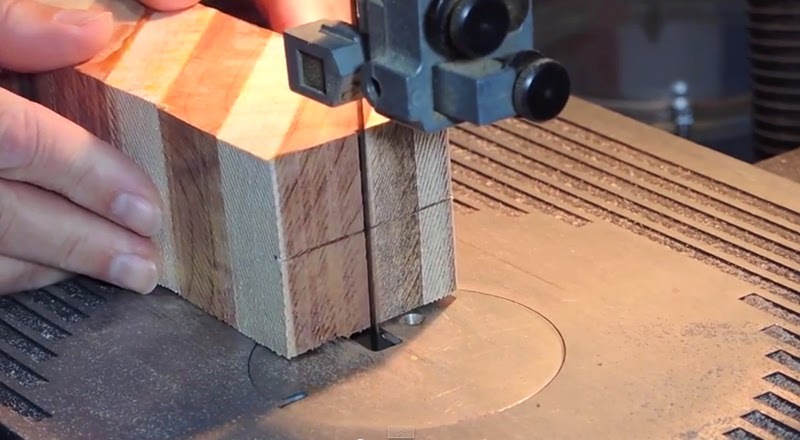 Making these bevel cuts before cutting the board into the four side pieces saves time. When cutting the four sides, I used my MicroJig Grr-Ripper as a spacer between the fence and the board to make accurate, repeatable cuts. I pulled it away to make sure the workpiece did not get trapped, then I used it to drag the piece away from the spinning blade. 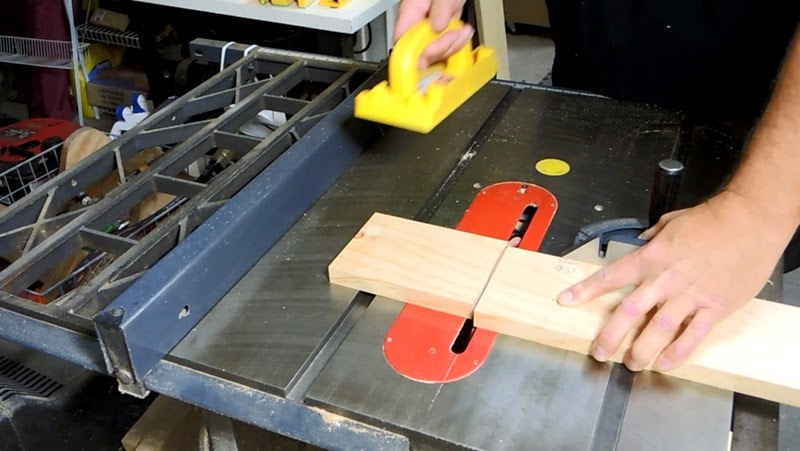 I made two passes on my table saw to cut a dado in each piece to accept a plywood bottom. The depth of the dado is about half way into the piece. Before assembly, I sprayed the interior sides with lacquer being careful not to spray the glue surfaces. I used electrical tape as a band clamp to hold the pencil holder together while the glue dried. The electrical tape stretches and pulls the joints together tightly. It is nice to have this Pencil Holder on my workbench so I can always find a pencil when I need one. Now I just need to keep it filled with sharpened pencils! 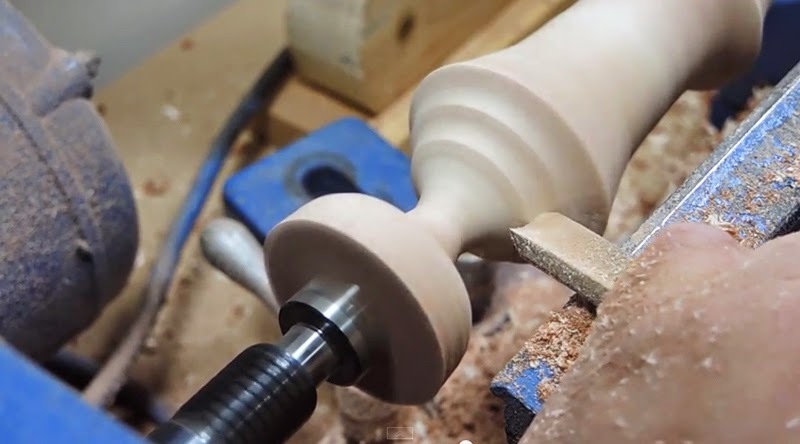 I created this fancy Christmas Ornament on my lathe for the 2014 Christmas Ornament Challenge hosted by Carl Jacobson and Alan Stratton. I usually only turn pens, so this was definitely a new challenge for me. Watch my video submission below. I started by cutting 5 pieces each of red cedar and curly maple that were 2.25" wide by 4.5" long. I glued them together, offsetting the ends by 3/4" to create a diagonal block. 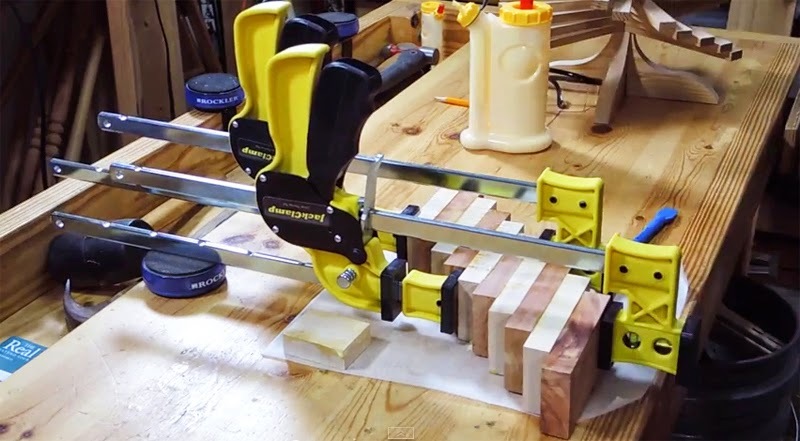 To make it easier, I glued up two blocks of 5 pieces, then glued those together later. Once the glue dried, I cut a 2"by 2" turning blank from the block on my bandsaw. Since I would be mounting it on the lathe between centers, I cut two centered shallow grooves into the end of the blank to help the drive center get a better grip. I used a roughing gouge to turn the blank until it was round. Then I alternated between my roughing gouge, bowl gouge, and skew chisel to begin shaping the ornament. As a general rule, I think things look more pleasing to the eye if they are in groups of three. So, I turned three triangular shapes that get progressively smaller toward the tip. On the top of the ornament, I turned three coves that mirror the three triangular shapes. I also added a little bead at the top where I could drill a hole and tie a string for hanging. I sanded the ornament smooth and turned both ends down to about 1/8" thick. I stopped the lathe and cut the ornament away with a knife. I think it turned out really good for being my first time turning a Christmas Ornament on the lathe. Best of all, my wife loves it and she wants me to make some more! Yippee, that means more shop time for me! Have a Merry Christmas and Happy Holidays! Click here to see all of the 2014 Christmas Ornament submissions! Do you have any Wooden Yardsticks? I found some wooden yardsticks in my father's shop. I thought they were neat so I brought them home to clutter up my shop for a couple of years. I recently took a closer look at them and realized these things are interesting pieces of history. 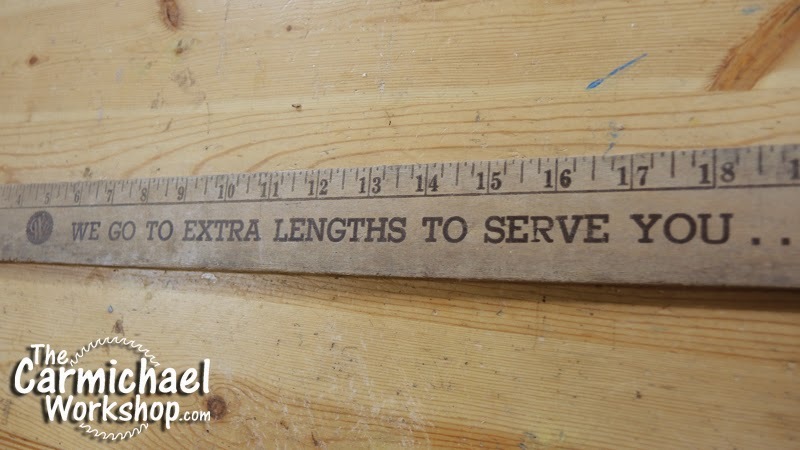 Companies used these yardsticks as promotional items with their logos and catchy slogans printed on them. I still see stores like Lowe's, Home Depot, and Ace Hardware selling these today. Their accuracy is somewhat debatable and I would only use them for rough measurements, but I like having these older ones on display. There are even some yardstick collectors out there! 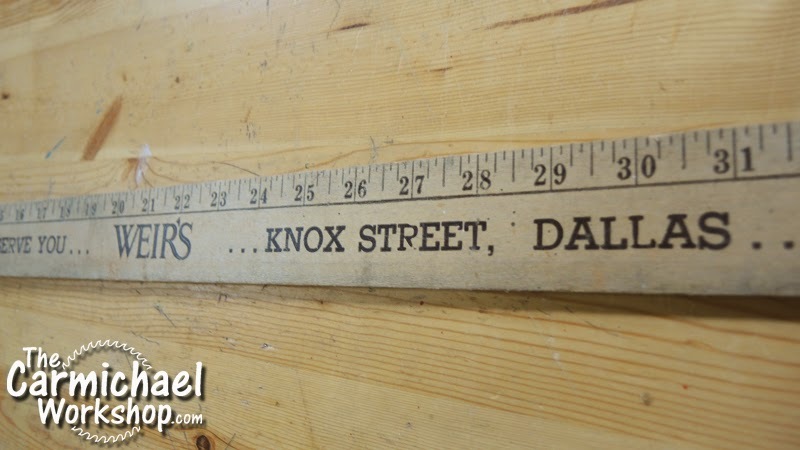 I have one from Weir's Furniture on Knox Street in Dallas, Texas that is actually 48" long. 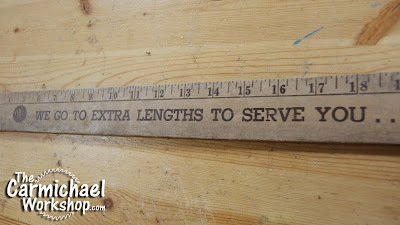 Hmm, would you still call that a yardstick? 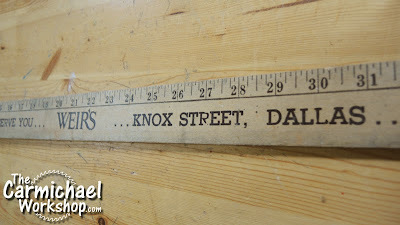 I have no idea how this yardstick from Dallas ended up in my father's shop. I will have to share these pictures with the people at Weir's Furniture. They still have a store on Knox Street and I think they might enjoy seeing this. 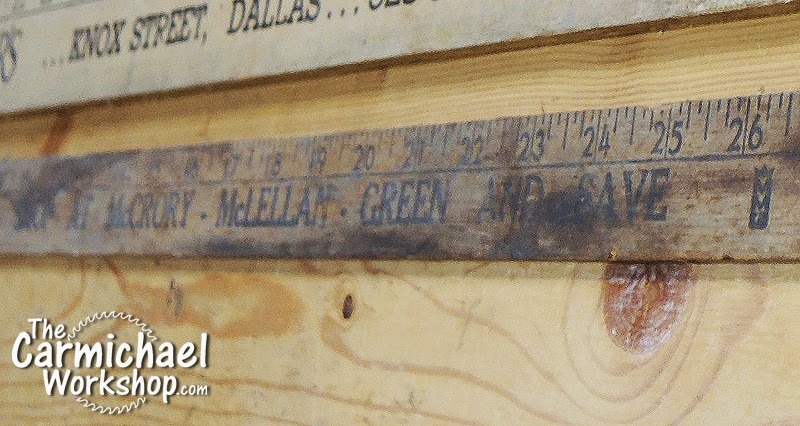 The smaller yardstick that is actually 36" long is from McCrory's, McLellan, Green and Save. A quick google search reveals that this was a chain of five and dime stores based in York, Pennsylvania. You can read more about that here, Again, I have no idea how this yardstick ended up in my father's shop in Georgia. Do you have any antique wooden yardsticks laying around your shop? If so, I would love to see them. Send me a picture on Facebook or Twitter or Instagram. Also, look up the company to see if they are still in business, because I bet they would love to see a piece of their history. 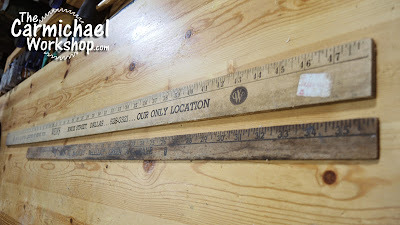 Don't be surprised if you find yourself scratching your head and wondering how these wooden yardsticks ended up in your shop too! 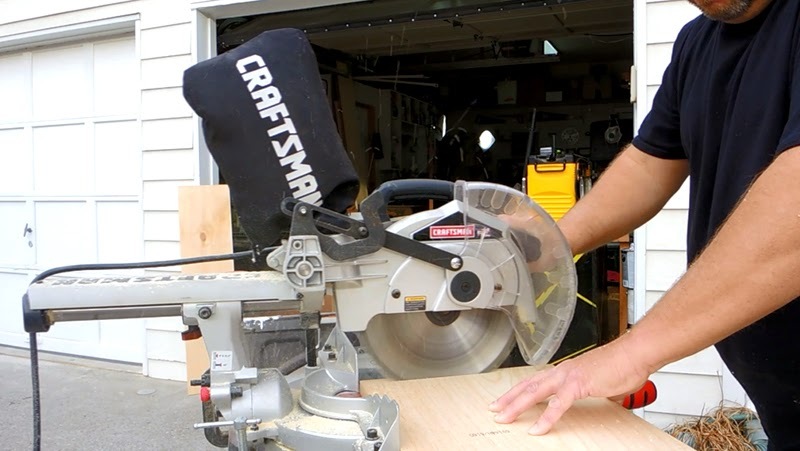 Have you seen The Maritime Woodworkers Weekend Shop Talk show? This weekend I was honored to be the spotlight guest on the Maritime Woodworkers Weekend Shop Talk Show. Each show is recorded and uploaded to YouTube, so in case you missed it, you can watch the recording of Saturday's show below. 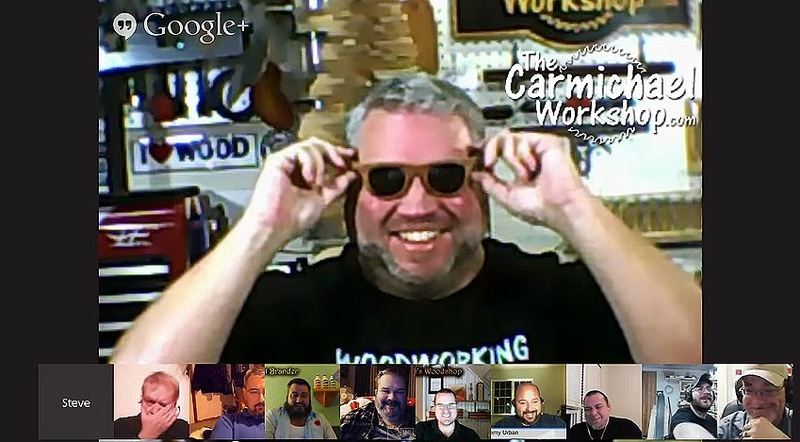 If you are not familiar with the show, it is a woodworking show in the form of a Google Hangout that airs live on Saturdays at 7pm EST. 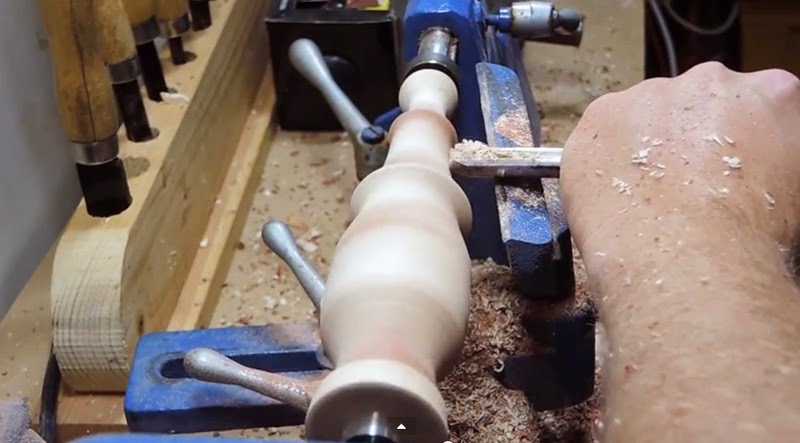 Check out the Maritime Woodworkers YouTube Channel and subscribe so you don't miss an episode. 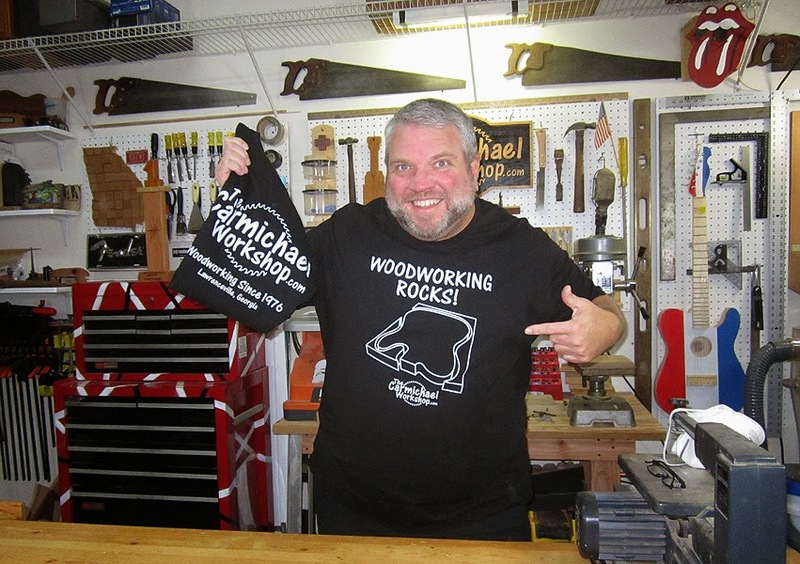 If you are interested in joining or watching an upcoming live show, visit the Maritime Woodworkers Weekend Shop Talk Page ahead of time to find out how. Thanks to the Maritime Woodworkers and everyone who joined the show to ask me some questions on Saturday. I had a great time and enjoyed talking about using my father's tools, coming up with ideas for projects, and other topics I don't usually get to talk about in my videos. I'm looking forward to joining the show again soon as a panelist and asking some questions of my own! How long will a Wooden License Plate last? It's been about 18 months since I made this Wooden License Plate. Our van recently bit the dust after transporting Carmichaels over 200,000 miles for 15 years, so I removed the license plate before we said our goodbyes. If you missed my original video on this project, watch it below to get caught up. Let's take a look at how the license plate has weathered over the last year and a half. I originally sprayed the license plate with a few coats of Deft spray lacquer as a test to see how it would hold up. A few days after the video, I decided to paint the logo black and gold with Rustoleum spray paint to make it stand out more. Overall, the wood held up well considering the harsh conditions it was under, but it doesn't look all that great anymore. This plate has been exposed to sun, wind, rain, sleet, hail, and snow. It's dirty and has turned gray where the lacquer has worn away. I suspect this is the effect of UV rays. Notice the spots where the lacquer remains and the wood color has not changed much. The paint held up pretty well, except where it has come off on certain lines of the wood grain, which is interesting. The back of the license plate is in much better shape because it was mostly protected from the harsh elements. So how long will a wooden license plate last? It looks like that depends on the protective finish. 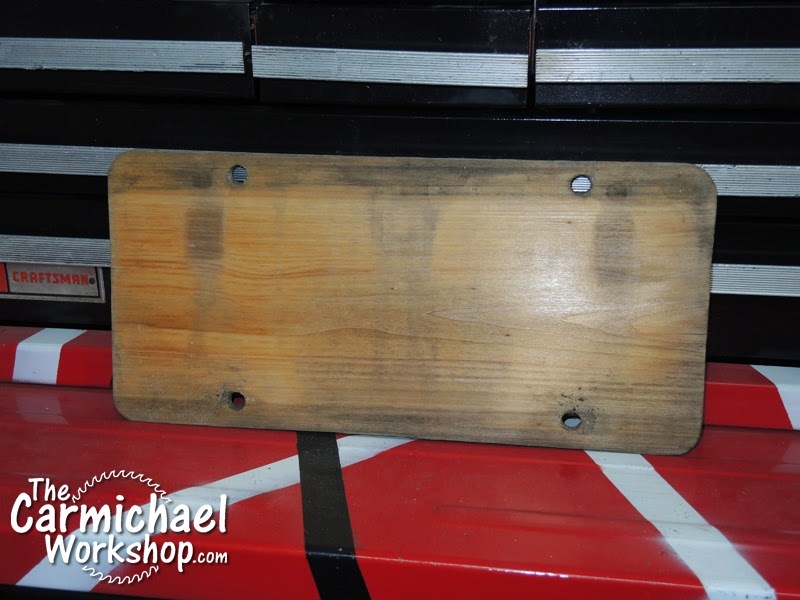 I was considering sanding the license plate down to the bare wood and refinishing it with a different product that would provide better protection, such as spar varnish. But, I've decided to leave it as is and hang it on the wall in the shop. I kind of like the weathered look, plus it has a story to go along with it. As a result of this project, I heard from people all over the world about which states and countries require official license plates on both the front and rear of vehicles. It appears that the majority do these days. My home state of Georgia still only requires an official plate on the rear. I wonder if that may change in the near future. That's ok, because these make great desk and wall decorations too! 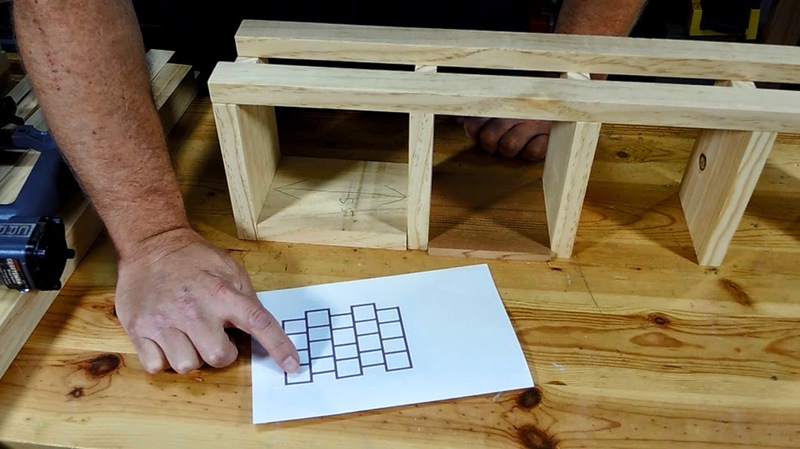 Did you know that many woodworkers who provide free content also sell merch? See a list of stores below! Consider ordering something from your favorite woodworkers to show your support! 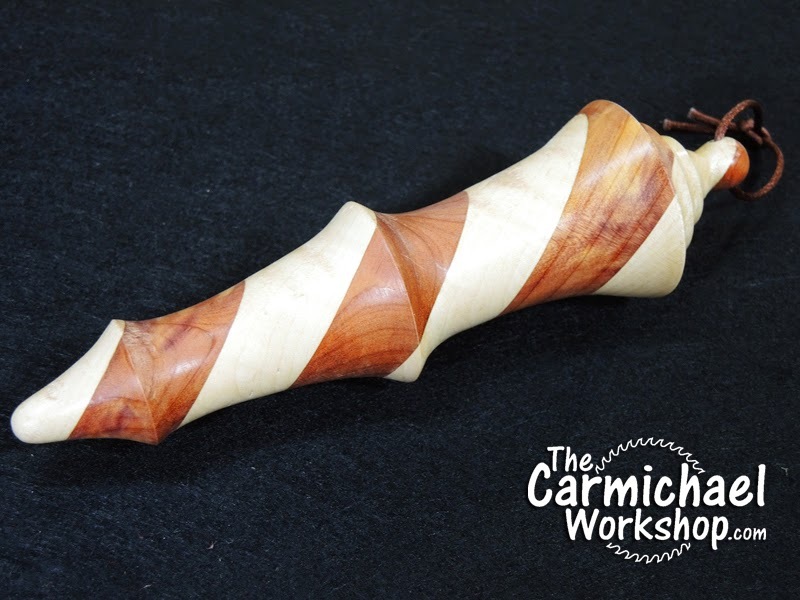 Click here to visit The Carmichael Workshop Store! 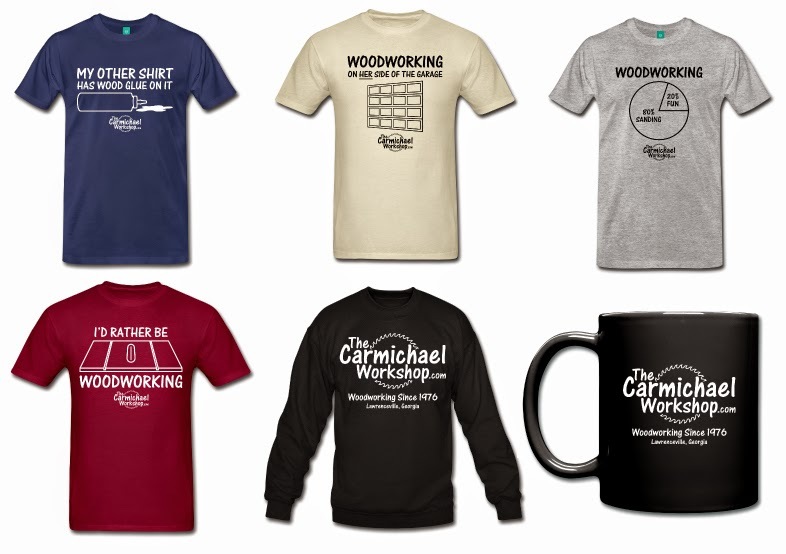 I recently started up The Carmichael Workshop Store where you can order a t-shirt, coffee mug or other item to support my habit of providing free content. 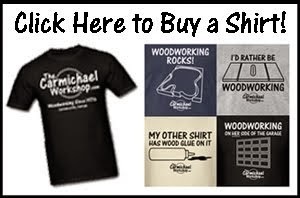 I created some original designs that I think woodworkers will enjoy wearing, plus these designs will let others know you are proud to be a woodworker. After all, t-shirts and coffee mugs are great conversation starters. If nothing catches your eye in my store, that's ok, because below is a list other fellow woodworkers who sell merch too! Just click the names below to visit their stores to see if they have something you can't live without, then impress your family and friends with your cool new woodworking gear! And in case you didn't know, you can order from different Spreadshirt.com stores at the same time! For example, if Spreadshirt offers free shipping on 2 or more items, you could add one item from Jay's store to your cart, then add one item from my store to your cart, then checkout! These are all of the woodworker merch stores I could find. Please let me know if you have any additions.